For anyone that has taken a full restoration to Joe (not the average repair that takes about a week or two), they learn the definition of patience. Limited space coupled with daily production of standard repairs and an innate passion for delivering the finest level of quality craftsmanship could delay a finished restoration weeks to years on a growing stack of dinosaurs waiting to be brought back to life. With the move to our spacious Kearny Mesa facility, Joe and Jojo have set a priority and focus to turnover old and new incoming restorations in a timely fashion. Joe and Jojo collaborate weekly on fresh sets of restores. They discuss each step and a timeline. This process allows Joe to continue his mentorship and Jojo to grow as the student. One great restoration story that stands out was a man named Lee Johnson from from Alaska who brought in his 1960’s Jacobs surfboard into the shop to get a full restoration on September 25, 2009 . It went STRAIGHT into the rafters at the old Morena shop to wait in line behind the other restorations to be started. Because Lee was in Alaska, he wasn’t even sure how he was going to arrange to get his board back, so he wasn’t pressing Joe like others were to do their boards first, and somehow the board stayed in the rafters for years and years and was discovered again when we moved to the new shop. Unfortunately, the receipt had faded over time and we did not have a number to call, so the board went back into the rafters. 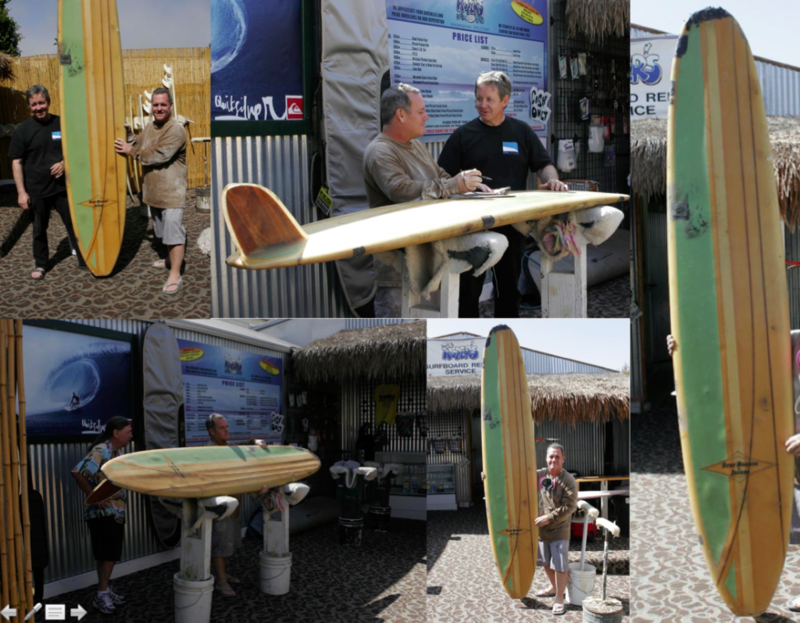 Suddenly, 7 years later, we get a call from Lee Johnson asking if his surfboard was finished! Startled, Joe knew exactly who it was, exactly what the board was, and where it was. Joe had been waiting for a call since he realized he still had the board when it was relocated to the new factory! Excited to hear from him, he got Lee’s contact information and immediately started the board (7 years later), and finished it in about 3 weeks. The board turned out beautiful and Lee was super stoked in lieu of the long wait. A great story-both parties excited, with Joe beaming with pride on the customer’s reaction and the quality of the restore. If you are interested in getting a custom restoration on your surfboard, give us a call to set up an appointment with Joe.